﻿ British cars for sale. Cars we have for sale and how not to buy a car. We have more titles for this section. We just can't decide so here they all are. Four wheeled automotive works of art are available for a change of stewardship in various conditions ranging from utterly forlorn and distressed yet ready for a whole lotta love to simply spiffy. If you read beyond our cars for sale listings you will find a lot of commentary about how to go about buying a car and evaluating it before or after purchase. 1958 Austin Healey 100/6 BN6 for sale. The true two seater. Considered by many beautiful people to be the most beautiful Healey built and this one is silver blue, a great color and Donald healey's favorite color. ( All the colors were his favorite.) One owner since about 1978. This car has four new wire wheels, new tires and tubes, working overdrive, new brake master cylinder, new front wheel cylinders and brake shoes, new rear wheel cylinder and brake shoes, new brake pipes, new brake hoses, working hand brake, new clutch master cylinder, new clutch slave cylinder and hose, rebuilt carburetors. New fuel pump. New fuel tank. The gauges look good and all are working. The engine runs well, smooth and looks good. Refreshed interior with new carpets, new cockpit insulation, reupholstered seats , new spare tire bag. The car was probably was painted in the early 1980's and garage kept since but has some scrapes and character marks. This BN6 is silver blue with blue cockpit. Solid frame. 1962 Jaguar E-Type roadster for sale -matching numbers with a Jaguar Heritage Certificate, four speed transmission, engine is complete, untouched and not running in many years. This car is a good visually solid very early XKE that requires complete restoration. Some time in the past, the chrome parts were removed and some of the paint was removed by a previous owner for a paint job that did not happen. The brake calipers were removed as well likely for rebuilding that did not happen. These parts go with the car. This car was sold new in Texas in 1962 and likely never left. Originally this E-Type was red with black cockpit. Available for 98K . 1948 Morgan 4/4 - BRG and RHD-beautiful condition. Original engine with numbers matching the bonnet numbers. New tires. New wiring, New brakes, New clutch. New Brooklands Bluemel style steering wheel, canvas top, tonneau and boot. The interior was redone in brown leather with wool carpets by experts in England. We are rebuilding the engine now and when completed this fabulous and very rare Morgan will be for sale. LHD-silver blue- a fantastic car for someone that wants the very best. This car had extensive body off the frame restoration with enhancements such as an alternator and A/C and electronic ignition. The engine was rebuilt with new pistons, bearings, oil pump, rod bolts, lifters, valves, guides. The transmission was rebuilt. The carburetors were rebuilt. The radiator was rebuilt with a new core. Has a folding moonroof, a new old stock grille and new old stock hubcaps. These are much more than simply rare parts. All exterior chromework was replated. All interior woodwork refinished. A new leather interior with wool carpets and headliner, new trunk upholstery and original Rolls-Royce monogramed headlamps. The car frame was sandblasted and Waxoyled and then primed with catalyzed primer and painted. The steering was totally rebuilt. The suspension was totally rebuilt with new front springs, rebuilt rear springs, rebuilt tie rods, rebuilt shocks and more. All work was documented and photographed. The car is a treasure and is likely the best driver example on the planet bar none. This classic and elegant Rolls-Royce Silver Cloud is Regal White with Scarlet Leather. 1960 is the first year for the Silver Cloud II and featured their first V8 engine with automatic transmission, power steering, power windows and air conditioning. This is a very clean and nice car that would work well for a Limo service wedding car or as a regular driver for someone that wants a beauiful car. For enhanced diveability and reliability this Rolls-Royce received several updates such as a high output alternator that replaced the generator for more electrical power. The distributor received a modern electronic ignition. The original V8 Rolls-Royce engine was removed, rebuilt and fitted with new spark plugs, distributor cap, ignition cables, cam followers, rotor, air filter, new motor mounts, new fan belts and new coolant hoses. The carburetors were rebuilt while the engine was out. The automatic transmission was removed and rebuilt. The brake cylinders were rebuilt. The power steering pump and steering ram were rebuilt. The car has behind the dash Air Conditioning and new hoses, a new rotary A/C compressor with a new drier were installed. The orignal burled walnut interior wood is clean lustrous and beautiful. The headliner was replaced with a new wool broadcloth headliner. While the engine and transmission were out for rebuilding, the chrome trim and glass were removed, door panels removed, many other parts removed and the car body repainted. The car was reassembled with new rubber seals. The seats and panels have the original scarlet leather. All the gauges are intact and original. White with gray leather- a great and very rare car as fewer than 100 were built, Lots of restoration and rebuilding work was done such as the front and rear suspension were rebuilt with new bushings, new ball joints and new tie rod ends. The four wheel disc brake system was rebuilt with new stainless caliper pistons, new brake hoses, new brake servo and rebuilt master cylinder. The KONI shocks were rebuilt by KONI. The rear suspension was rebuilt with all new bushings and the differential re-sealed. The engine was refreshed with new gaskets, timing chain and sprockets, new motor mounts, electronic ignition, water pump and oil pump. The radiator was rebuilt with a new core and the orignal electric cooling fans were rebuilt. New coolant hoses. The tires are new Vredestein radials. A new carburetor was installed and the fuel tank was removed and cleaned. The fuel pump was replaced. The original wood dash was removed and refinished. The front and rear windshield were removed and new rubber windshield seals were fitted. All in all an excellent example of a very scarce car. The interior is original. There were two very small areas of rust under the car near the rear axle and both areas were cut away and new metel welded in. New door window felt seals were installed. A new exhaust system has been fitted. If you have a serious interest in any of the above cars, send us a e-mail note, no phone calls please, pictures are not available at this time and we will contact you when that car is available. 1952 Austin A40 Somerset Convertible for sale- A restoration project and a very solid rare car. LHD Comes with a original engine and transmission along with a new wiring harness and some spare parts. A fellow dropped by one day and asked for advice about buying a Rolls-Royce. We told him to buy the best car that he could afford and stay away from “on line auction bargains”. He had around $25K to spend. Instead of following our advice, he did the exact opposite and bought four dilapidated late 1980's Rolls-Royce and Bentley cars for around $5000.00 each. One of them, a 1988 Bentley Mulsanne was purchased in Florida. The story we were told was gradually revealed over time by the car and the owner. The short version was that the car had been left on a beach until the tide came in and salt water inundated the car chassis . The engine had salt water in the cylinders and in the exhaust system. The car was towed to a local Florida shop to fix. They flushed the motor and removed the salt water from the engine by stupidly loosening the cylinder head bolts until the water ran out. They supposedly made it run. The engine had a resulting coolant leak from one of the head gaskets. The new owner described himself as a "master mechanic" and bought the car with full knowledge of the salty encounter and the head gasket problem. He had the car shipped to Houston. On the way the car was vandalized and parts were stolen from the engine compartment such as the emission air pump, various hoses and valves and cooling system parts. Crude attempts were made to steal other parts resulting in damaged and bent parts. The car was then transported to us to repair the head gaskets. As we examined the car while doing the head work, we found that the car was extensively rusted and the rear springs were in danger of breaking loose as the retainers in the rear trailing arms were very corroded. The front shocks were so badly worn they had ground egg shaped holes in the upper spring plates. The body panels were growing rust and all the under chassis parts were badly rusted. The metal fuel lines were so rusted that they leaked fuel under pressure. The fuel filter was corroded and seized solid to the metal fuel lines. We discovered that at some point in the past, the catalytic converter had gotten very hot and had melted the insulation off the wires in a wiring bundle located inside the car. The story goes on and on so the lesson to be learned is what? 1. Don't buy a car that a rising tide found its way into. 2. Don't buy bargain cars unless they are extensively and expertly checked out unless you plan to invest a great deal of money into the car with unknown results. There are good deals around but paying $5000.00 for a car that would normally will sell for many times that amount if in good condition is highly risky. There is an old saying that an honest man can't be conned but this is not true. Cars, fine paintings, Egyption antiquities, fashion models and such for many decades have been expertly detailed to look good for a cursory examination or photo shoot by clever fakirs. Falsifying something that has very dubious value to have an enticing salable appearance to those that won't or don't do proper research has been going on for many thousands of years. It's just the way it is. 3. Never loosen cylinder head bolts to release tidal waters. 4. Anything and everything on any car can break, fail or fall off at any moment no matter how new the car is. New cars have many more parts than vintage cars so more parts will be failing and falling off of them for far longer. This unlucky 1967 Rolls Royce Silver Shadow was being sold ( as a car) by a junk yard. Probably not the best place to buy a Rolls-Royce from? Glowingly described as a "beautiful car". By happenstance we had examined this particular car a few years previously and determined that the poor thing was a very sad and rusted out heap of junk with a Rolls Royce grill hanging on to rusty metal. We told the owner not to waste money trying to fix the car as no good end could be had. The car did not rate as a good parts car as it was a disintegrating mess and the owner took the car away and sold it to a local car dealer junkyard sort of place. Click the photo to expand it, examine the background and you see junk cars sitting around. They were asking $12,000 for what was long ago a great car. We can say no more. "We can't take anything with us when we leave this world but cars sure are a lot of fun while hanging around here.."
attributed to S. MacClymondsvitz XXXXI while talking with a funeral director. If an enthusiast has a serious interest in a car we have available, please call or Send us a Email for detailed information. We are not a car museum although we may look like one at times as we are fortunate to have a continuous back log of interesting and complex work booked into the shop for owners eager to have their cars returned as soon as possible. Selling cars is not our main line of business. Repairing and restoring cars is where our main interests stay focused. After all, it's far safer to buy a car from a knowledgeable business like ours with a long and impeccable reputation than from the great unknown auction world where what you see in a photo is what you may or may well not get. Thus we appreciate serious queries about cars we offer for sale. If a car is not of a color of one's liking or perhaps the year model is not the one sought or the car is not desired for any reason discernable by photograph or description, why waste time on it? We all save time for better pursuits and life is too short to waste. We are happy to e-mail photos to allow inspection of photographic condition and are able to give detailed descriptions of known condition or history. If a car maintains interest, we can set up an appointment for personal inspection. If you are a car broker looking for a quick buck, don't call us. Thanks a lot, we really appreciate it. For those of you that enjoy reading our meandering narratives and a little bit of pontificating about cars and money, read on as these cars symbolize both a continuing series of technological innovations and un art de vivre meaning they are great fun to drive. Certain cars are genuine fun machines and are more enjoyable than watching stock prices go down unless you are into that sort of thing and this is ok! Car values are determined by traditional market supply and demand not by the futures market, derivatives, hedge funds or complicated financial schemes purposely designed so that few can understand them. Nothing is difficult about understanding why a certain car gives you a thrill whenever you see or drive it. Desirable cars seldom or never drop in value overnight like stocks can and do. The value of a car does not depend on the futures market as the future is murky. So, buy a car from us and enhance your net worth! "Ultra automotive sophistication can rob the joys of simple and primitive pleasures that can be most enjoyable ." says Scotty while rebuilding a V12 Jaguar engine. Great styling is something many late model cars lack as a beautiful shape does not necessarily have a good drag co-efficient. Italian car designers are inspired to make their cars look like beautiful women. It is true that many women don't appreciate this concept as they do not thibk they look like a car but there it is. This sexist concept does take a bit of imagination and a few glasses of wine to appreciate but the long gentle curves of an early Ferrari or Alfa Romeo do look great. Women were probably not designed with a wind tunnel yet manage to look fabulous anyway. All modern cars are designed with careful attention to drag co-efficient using wind tunnels and CAD/CAM design. This is a good thing as modern cars are aerodynamically efficient yet as a result most modern cars look much alike. To some people cars are like a lawnmower or toaster and they could care less what they drive as long as it is cheap to run. This is not a bad thing but these people would not be interested in reading this website. Boring cars get a person around but so could a well designed horse. If the grille badges from a 2016 Mercedes Benz and a 2016 Lexus were swapped would anyone really notice? It's always wise to ask a lot of questions about purchasing a car or anything expensive. Few sellers are going to tell you anything unfavorable about their wares unless you ask them direct questions and then you might get blank stares. This is the way of the world. It is best to do some homework and know something about what to ask so you don't resemble a duck waiting to be plucked. Our website is full of photos and stories that provides some things to look for or to look out for. There are truely horrible cars out there that car flippers find in swamps and weird places. They give the cars a wash sometimes and sell them to the uninformed for much more than the car is worth. We see these tragically rusted or abused cars from time to time and is why we always suggest having someone knowledgable inspect a car before purchasing. Beats a heart that does not soar when driving a vintage Jaguar, a classic Rolls-Royce, an always beautiful Austin Healey 3000, a mysterious Bristol, a cool MGA, a handsome Bentley or a ferocious Mercedes Benz 300sel we wistfully enquire? If not then it's a cold heart and needs some warming up. A good way to do that is to buy a car such as those that we offer even though we do not have many left to sell! Driving cars and airplanes was probably not a part of the original human design plan. Sporting cars were designed to be driven by those that enjoy driving cars that look great, handle well and have a exhaust note that gets a person down right excited just to be in the car. There is much more to a fine car than brute horsepower and modern cars are better than vintage cars in many ways yet are also not much fun in many ways as being totally safe is rather boring isn't it? We all need a bit of sporting now and then to ruffle our feathers and make living ever interesting. A great car can do this. For example, the engines in vintage sporting cars were designed to be admired for their mechanical beauty and exhaust systems were designed to have a delightful throaty note. The Italians designed cars that were inspired by beautiful women. The Italians also made the best sounding exhaust systems and espresso machines and there is nothing better sounding than a snarling E-Type or a roaring Austin Healey 3000 with an ANSA exhaust. Beethoven would have loved these cars! Many engines like 1950-1968 Jaguar motors were beautiful Machine Age designs with highly polished aluminum cylinder heads and cam covers adorned with chromed acorn nuts and two or three carburetors and are quite unlike most modern cars that feature boring looking engines buried beneath plastic covers so the engine looks like a big ugly plastic battery. Many car manufacturer designers are not the brightest of lights or are they really giving us what we want in a car these days? Do we really want ugly engines? Modern cars are filled with expensive electronic modules that control just about everything as the makers surely must think that people are too stupid to pull a knob or be able to park the car themselves. As a car gets on in years the cost of some of these components stay absurdly expensive yet the self serving managements of many car manufacturing companies keep making modern cars ever more complex with increasing layers of complicated electronic parts that prevent cars from being affordably fixable when the cars have depreciated for a few years. That is the master plan. The fine vintage cars we deal with were made from steel, leather, chrome, Ambla, fine woods and Rexine materials that were styled to be admired by those that appreciate beautiful cars. Early car models were made using the eyes and hands of artistic human beings that knew how to design a car that would make a persons head spin around. Jaguar Cars founder and designer, the brilliant Lord William Lyons had his cars designed using full size clay mockups. He directed his engineers to build these mockups on his home driveway so he could think about the designs while he had his morning tea and crumpets. When he looked out the window and the car was beautiful from every angle, that was the design. Thus the cars we like to own have humanistic charms and flaws that make them ever more endearing to the soul. We honor the spirit of great automotive design with our restoration work. "For what is the meaning of this moment without considering and savoring the beauty of that which once was?" says Scotty while considering and savoring the beauty of that which once was every day of the week. Have a look at some cars we have available and keep in mind that we offer a full and comprehensive pre-purchase inspection service if your car quest is not to be found on our steadily shrinking list of automotive offerings. Many cars have been sold so the list is growing ever smaller. 4. "totally restored" These cars are usually offered with no detailed documentation of any restoration work that was supposedly undertaken. Generally the price is a fraction of the parts cost alone that is required for a proper job much less the labor involved in restoring a car. Lots of times the car is being sold by a car lot claiming to be a "specialist". The phrase "frame off restoration" may be claimed but such cars are usually offered without supporting photos, invoices or anything other than words. Lots of times we have seen this claim made for cars that do not have a seperate frame. Anyone offering a car that had a frame off restoration should absolutely have lots of visual proof that details the work and parts that went into the project. 7. "The car is a 10 out of 10." Anyone making this claim is highly likely not to have a clue about cars as very very few cars in the world can honestly be ranked as such and these cars are rarely offered via on-line auctions. A new and undriven Bentley would quality as a 10 for a time at least because the Bentley factory does everything with every skill known to make the cars perfect until the car enters the reral world and the inevitable something is banged against it. Then it is no longer a 10. 8. We have seen some unscrupulous car dealers anoint themselves with names that imply that they are elite car museums or are affiliated with the Rolls-Royce or Bentley or such factories. There are also "appraisers" that claim to be members of appraisers organizations when they actually have no such affiliation. It is best to ask for documentation and credentials so you know if you are speaking with a con man or someone genuine. 9. The following advertisement was cut and pasted word for word from an actual advertisement to sell a 1960 Rolls-Royce Silver Cloud. "Hard to find original unmolesder car. This vehicle appears to have never been smoked in. The wonderful condition of this vehicle leads us to believe it has been garage kept. Bid with confidence this vehicle is being offered with a Limited Warranty. All vehicles are sold as-is and without warranty. Seller makes no representations or statements as to the fitness for purpose or condition either implied or expressed." "Appears" and "leads us to believe" are the sort of opaque descriptions that have a lot of wiggle room. There is a limited warranty of some sort offered but the car is being sold as -is without warranty. So which is it? The purpose of a car is to drive it but the seller make no representation that this most basic function can be done. A great many more people smoked tobacco in past times than today so the odds of any older car having never been smoked in is possible but the odds are against it. Very confusing eh? 10. There are many car ads wherein most of the verbiage is devoted to proclaiming the seller to be a world renowned car expert, a well regarded car collector, a swell of a fellow/business by any description, a veritable paragon of automotive virtue that is uninterested in making money and whose only charitable interest is sell a car to you for the pleasure of doing so. Example of typical psuedo-altruistic advertising is below. Here is an advertisement for a 1959 Austin Healey 3000 in a recent on line auction. We parsed the verbiage and made comments in italics. Fair enough and as the car has been stored for many decades the car is and has been dead as a stone. As the engine has not been running in the last 30 or so years, the condition of the engine is highly suspect. The brake and clutch system will be in need of total replacement as will the fuel system and this is a beginning. Much more work will need to be done to make it a real driver. Driven regularly but not for the last 30 years. Time flies. The last time I was 30 years old that was over 30 years ago. The car was also missing the turn signal switch and other electrical parts but who is counting? Ok, so the body has excellent rust and bubbles. The floors are rusted out. The trunk lid is rusty. The doors are rusty. The car has been quietly rusting away the last 30 years but things “look pretty good but may need attention” to this seller. Hmm. The bumpers are useable for a driver. Useable likely means if the bumpers were to hit a chipmonk the bumpers would plough through? “ 5 wire wheels and the top bow with the header rail are here as well as a set of side curtains. The car is one of the most complete this seller has seen and is just missing a few things like the top dash pad, convertible top, turn switch and whatever else. We can say no more about this claim except we will. The car shows he is referring to must be held at a junk yard, . Right. This car will have no surprises. This would be a surprising miracle and the car would take divine intervention and a mountain of money to make it into a good car again. Easy for someone else to do, not this guy. An advertisement like this provides plenty of reasons to run away from this car unless it is a genuine bargain which is unlikely. The seller either knows nothing about vintage cars and might as well be selling old sofas or just makes up the story as he goes along looking for that one sucker to buy his heap of rust. Below is an ad copied word for misleading word (Except that our snide comments are inserted in parenthesis) for a smashed Bentley Flying Spur being sold as an insurance total. Buyers should run from such cars and buy the best car they can afford. 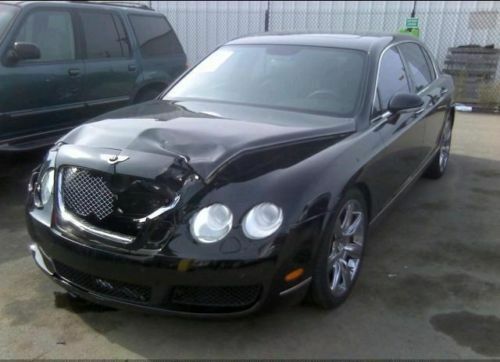 If a car like this is all you can afford, getting it repaired properly is likely beyond your means as it was beyond an insurance repair cost estimate. To be clear, we are not selling this car. Another sucker sales ad for a pair of Jaguar cars. "Both of these fantastic cars have been stored since the early 1970's. The E Type is a 1962, the XK150 is a 1961. They both ran and were in excellent condition when put into storage. They could be back on the road with minimal work (fuel system, brakes, tires and fluids) as far as I know they retain their original drive trains. " Let's drill down into these claims. The Jaguars have been stored for 46 years or so. Such long storage means that the engines will need rebuilding, all rubber parts replaced, all fuel related parts such as carburetors, fuel tank, fuel lines, fuel pump are shot. The cooling system will require rebuilding, the wiring is ancient, the rest of the electricals are in dubious shape and everything else will need attention as cars don't improve when stored 46 years. These are both worthy cars for restoration but claiming that they need minimal work is a false claim. A fellow from New York called to tell us that he had just purchased a 1959 Rolls-Royce Silver Cloud from a vintage car dealer in St. Louis. The car had not had recent documented renovations. The description did not mention the lack of brakes. When the car was delivered, the new owner discovered the brakes were not working and the engine was running on less than six cylinders. There were numerous other issues. The car was purchased over the internet via photos and the buyer did not take the time to drive the car before purchase. The seller had suggested to the buyer that he make the trip, drive the car and check it out first but the buyer did not do so. A lady from Texas purchased a 1966 MGB from a "classic car dealer" car lot in Omaha Nebraska based on an advertistment in a classic car sales magazine. She bought the car using photos and e-mail descriptions. The seller told her in writing that the car had been completely restored. He also stated that he inspected the car. The buyer paid $15,000 and had the MGB shipped to Texas. When received, she drove the car and found it had very bad brakes and was undrivable. She called us and wanted to have it inspected. We did so and found that the entire brake, steering, suspension, electrical and cooling systems were completely worn out, rusted, dilapidated and had obviously never been restored. There was rust damage to the frame and body. The entire underchassis was layered in rust. There was a large rust hole in the floor covered over with cardboard. The old original electrical wiring loom had been re-taped with blue tape so it looked photogenic. The paint looked good though and the car had a nice interior so showed well in photos. We wrote up a depressing report with the facts and she called the seller and told him that the car was not as described and she wanted her money back. He told her to get lost and would give her nothing. This MGB buyer went wrong by not taking the time to travel to inspect the car nor did she find someone other than the seller to inspect the car. The car dealer surely thought this was a wonderful transaction. He got paid and never had to show the car or have it inspected and the car and its many problems went out of state to a trusting buyer. That was that except for the lawsuit. The internet has been a wonderful thing for unscrupulous sellers of just about anything so buyers should be more diligent if they don't want to be unscrewed from their money. In this photo you can see several fingers poking through the floor. This hole was not a factory option. Soon after the owner bought the car, he asked us to replace the entire interior and after we removed the carpets we found a hand made piece of plywood covering the entire drivers side floor and the non standard rust hole. In the above three photos you can see a front suspension that has not been worked on by a professional in many decades. It is always the mechanicals that are frequently ignored and such cars are frequently sold as "restored" using on line auctions. So, the lesson here is always to have a look at what you are purchasing. Unscrupulous car sellers know that many buyers are unknowledgeable about cars and many buyers base decisions on superficial appearances like a paint job or some chemical shine on the tires. So the seller polishes the apple and leaves the rotten core for someone else to bite into. Rotten apples should not sell for as much as a nice ripe apple but they do all too often. 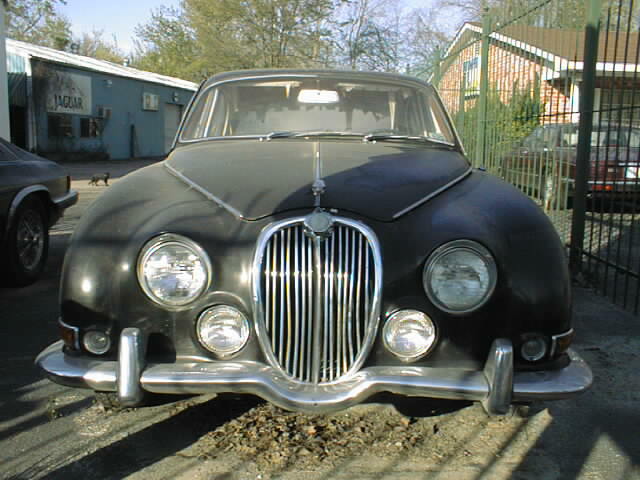 Here are photos of a 1958 Silver Cloud with a rotten under chassis or frame. The car was purchased using a well known on-line auction from a Florida car dealer-junkyard for around $32,000. If you look carefully you can see that at some point in the past someone welded some thin metal on top of rotten heavily rusted metal. This sort of thing does nothing but mask the rust problem. This metal is also rusting away and this entire frame area is rotten. The front fenders depend on these parts for support and these fenders were moving up and down with the bumps on the road. The car was advertised by the south Florida car dealer/junkyard as being "totally restored". The buyer did not have the car examined by a professional prior to buying it. He did travel to Florida to look at the car but could not test drive it because the steering wheel had been removed for "polishing". He bought the car anyway and his troubles began. When this car was delivered, it had no brakes at all. The engine barely ran and the transporter almost wrecked it taking the car off the delivery truck as the brakes were not functioning. The paint work was very old and appeared to have been sprayed by a drunk painter on LSD in a dust storm. The chrome or what was left of it had been sanded with heavy grit. The shine was gone and all the trim was in dreadful condition. The new owner could not find anyone locally to repair the brakes so he shipped the car to us. We examined the poor car and found the brake cylinders to be rusted solid thus the car had no working rear hydraulic brakes. The front brakes were in terrible condition. Of course for $32K, the car had never been restored and had not been rebuilt nor had it any decent care in several decades as far as we could tell and we could tell a great deal. Look again at the photos of severe rust in the frame areas. We call this car totally rustored. Once we heard the too familiar and sad story on the car, we suggested to the owner that he return the car to the seller and get his money back as $32,000 was way too much to spend on a rusted out junk heap that was a poor parts car at best. Surprise!The seller refused to give the money back yet also claimed he could rebuild all the brakes on the car in just two hours. This was an amazing claim as only Superman might be able to do it if he knew how. The brake pipes were rusty and all the cylinders were rusted solid with no telling what else so we told the owner to take up this seller offer as at this point he had nothing left to lose except perhaps his life due to brake failure or the car breaking in half. So he had the car shipped back to the Florida seller. All these shipping costs were paid by the new owner. It was a bad deal for everyone but the seller I suppose. For the seller, it was a "good investment". On line car purchasing is a buying method fraught with peril as most any car can be tarted up to look good in a series of digital photos. What you see may be a fraction of what you get and many people sell cars via on line auctions because they do not want or cannot sell these cars in their local areas because they don't want to be sued or assassinated. This is so because the cars may be in a pitiful rusted or mechanical condition. Photos can show what the photographer wants to show or what they don't want to show. Ever heard of Photo Shop? This is not to say that ALL cars bought via on line auctions are Trojan horses waiting to pounce on your wallet but some certainly are. Avoid purchasing any car that is advertised as "totally restored" or " buy from the best" as 99.9% of the time this is not true. We strongly suggest that any major automobile purchase should be inspected by a knowledgeable person before purchase. In other words, don't be a dolt. Instead, be a smart cookie! If you had a moment of adrenalin fueled rashness and bought a car that was advertised as "totally restored" for an all too cheap price and it turned out to be the rusty heap of junk that it should have been advertised as, now you have to deal with the consequences of making a rash decision. We all do such things but why not be sensible? A before purchase examination by a pro is simply sensible. Otherwise such purchases can be like playing craps with someone else's loaded dice. Sometimes you win and sometimes you lose depending how the people holding the dice feel about it. We prefer our clients to purchase good cars so we do offer a most comprehensive inspection program for automobile purchases and many shops around the country do this service as well. NEVER go by an inspection the seller or a friend of the seller provides as there is a genuine conflict of interest. If a professional inspection is not possible, be sure to ask LOTS of questions keeping in mind that words and phrases like "restored", "rebuilt", "everything is new" or "perfect", have vastly different meanings to people. If you have to have a perfect vintage car, you will never be happy as nothing made by humans is perfect especially a vintage anything. 11. Frame off restoration. We have seen this claim made many times about cars that don't have a frame as the car is a unibody design such as a Silver Shadow or MGB. The brake servo was found to be missing internal parts and was inoperative. The brake servo hose was leaking. The rear brake fluid pipes were crushed flat and allowed no brake fluid to reach the rear wheel cylinders. The rear wheel cylinders were rusted solid and the brake shoes were soaked in axle oil. The differential had almost no lubricant. The fuel pump had been replaced and the new pump was found bolted to the rear sway bar causing it to float up and down with the suspension and this situation caused the fuel hoses to crimp and uncrimp, crimp and uncrimp. It was a crimp'in mess. The front brake calipers were rust seized, the front brake hoses were rotten and torn and the front brake rotors were very rusted. The brake caliper bendover tabs were missing. The clutch slave cylinder and master cylinder were bad and a non standard clutch hose had been installed creating a very strenuous clutch action. The Weber carburetor was actually installed backwards and the linkage and cables were in a bind. The carburetor was trashed internally from very long term storage with old gas and required replacement. The water pump had been replaced but the part used was for an earlier model MGB and incorrect. This placed the fan belt at an improper angle. The harmonic balancer/pulley had been forced rearwards with a pry bar until the rubber bonding broke and the metal snapped on the balancer/pulley. A too short fan belt had been forced on. The coolant was ancient and full of contamination from the disintegrating radiator and cylinder block cooling galley rust. The transmission mounts were sagging and rotten. The original temperature gauge had been removed and a cheap replacement installed. 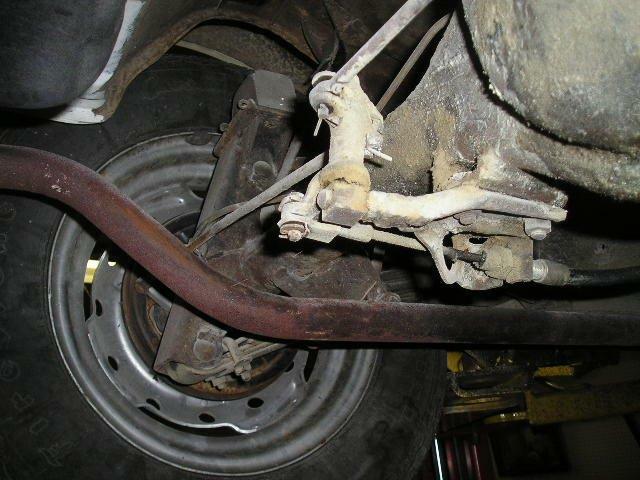 The rear sway bar bushings were rotten and worn out and the rear sway bar was loose. The exhaust system was rotten and broken, the exhaust mounts were broken. The passenger window would not roll up or down without breaking the handle. The thermostat housing was cracked, the clock was DOA and the inside lamp was found held together with electrical tape and stuffed into place so it looked like a lamp. We fixed all the above as the new owner wanted to get the car into decent driving condition and the bill was substantial. Magic Paint is a wonderful thing. There are folks that believe or want to believe that painting something with a spray can is restoring or rebuilding it. These are not people that you want to buy a car from. Some car sellers claim their car has been "totally restored" for much less than what the parts to do so would cost! Don't buy a car from these people either. Of course a buyer may choose to be like the Captain of the Titanic was. .
"Hey Captain, this weather bulletin says there are lots of icebergs out there!" Says the soon to be drowned Marconi radio operator.
" The sea looks good to me so full speed ahead while I take a nap. Don't bother me unless you hit something really big", says the laughing and smiling but soon to be briefly embarrassed and forever drowned Captain. So, buy a great car that makes you happy but have it checked out first. Here are some cars that have passed through our hands and found new owners. 1935 Rolls-Royce 20/25 with Barker coach work. Thanks Sold! 1979 Rolls-Royce Corniche Thanks Sold! 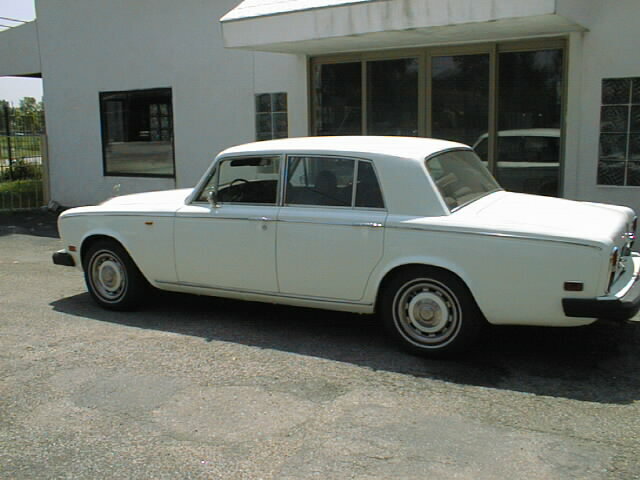 1976 Rolls-Royce Silver Shadow Thanks Sold! 1975 Silver Shadow Long Wheel Base Thanks Sold! 1988 XJS V12 Convertible Thanks, sold! 1975 Jaguar XJ6C Thanks Sold! 1965 Jaguar 3.8 S Thanks Sold! 1977 Jaguar XJ6C Thank you, Sold! 1971 Triumph TR6 Thanks, SOLD! 1960 MGA Coupe Thanks SOLD! 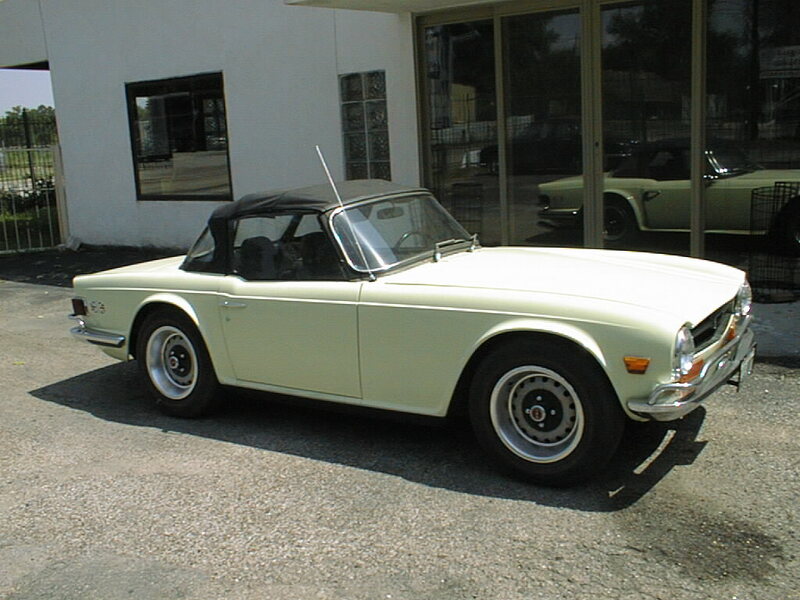 1970 Triumph TR6, Thanks Sold! 1961 MGA Roadster Thanks Sold! 1980 Triumph TR8 Thanks, Sold! 1957 Jaguar XK140 Roadster Thanks Sold! 1969 Silver Shadow Thanks Sold! 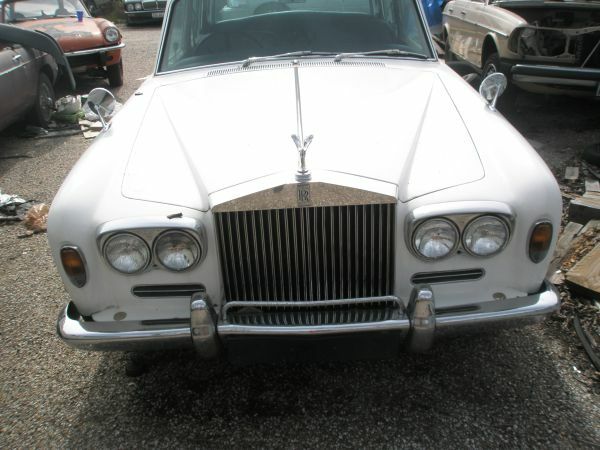 1978 Rolls-Royce Corniche Thanks Sold! 1980 Lotus Esprit Thanks Sold! 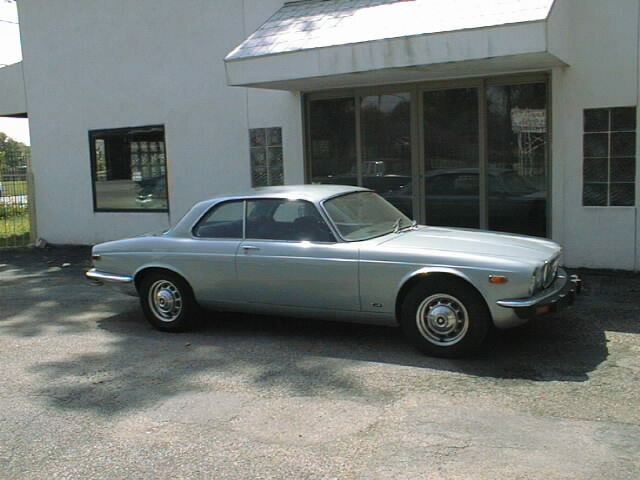 1975 Jaguar XJ12C Thanks Sold! 1976 Silver Shadow Donated and Sold! The total funds from this car were donated to Texas Husky Rescue. 1978 SilverShadow II Donated and Sold! The total proceeds from this 1978 Rolls- Royce SilverShadow II were donated to Habitat for Horses an animal rescue group. 1987 Maserati Spyder Donated and Sold! The total proceeds from this car were donated to Texas Husky Rescue. 1960 Austin Healey 3000 BN7 Sold! 1971 Mercedes Benz 300SEL 3.5 Sold!